NASA’s Nuclear Spectroscopic Telescope Array, called NuSTAR, has taken its first glimpse of our galaxy’s supermassive black hole, thanks to a recent flare-up at the galactic core. NuSTAR, a state-of-the-art, space-based X-ray telescope, was aimed at Sagittarius A*, a compact radio source identified as a black hole, for two days in July. The goal was to better understand just what makes our galaxy's central black hole so different from others. Compared to other galaxies, the Milky Way’s black hole is relatively calm. While other supermassive black holes devour gas and stars around them, releasing large amounts of energy in the process, ours only seems to have the occasional light snack, showing just a bit of activity as matter is consumed: the tell-tale burst of energy seen in X-ray and radio emissions. According to Fiona Harrison, NuSTAR’s principal investigator at CalTech in Pasadena, California, fortuitous timing plays no small role in observing the activity. 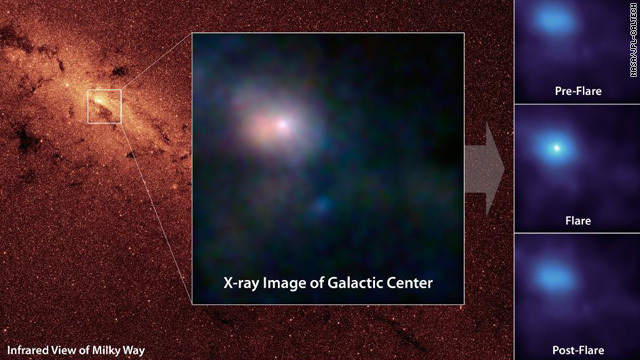 “We got lucky to have captured an outburst from the black hole during our observing campaign. These data will help us better understand the gentle giant at the heart of our galaxy and why it sometimes flares up for a few hours and then returns to slumber," she said in a written statement. Thanks to the instruments aboard NuSTAR, the team was able to see the X-rays created by matter being heated up to approximately 180 million degrees Fahrenheit (or 100 million degrees Celsius) in regions where particles are accelerated close to the speed of light. "Astronomers have long speculated that the black hole's snacking should produce copious hard X-rays, but NuSTAR is the first telescope with sufficient sensitivity to actually detect them," team member Chuck Hailey of Columbia University said in a written statement. Fred Baganoff, a NuStar team leader at the Massachusetts Institute of Technology, stressed in an e-mail the importance of the NuSTAR data for getting a clearer picture of the dark heart of our galaxy. Taken with data from other observatories (NASA’s Chandra X-ray Observatory and the W.M. Keck Observatory in Hawaii were also pointed at Sagittarius A*), scientists hope NuSTAR can shed light on the activity cycles and evolution of black holes. There is also a wealth of non-black hole related data that the X-ray space telescope will help scientists understand, Harrison said. Four months into its two-year mission, NuSTAR is off to a promising start. Launched in June 2012, NuSTAR’s mission is to conduct a survey of black holes throughout the universe that are millions of times more massive than our own sun. As for what's next for NuStar, Harrison said it is working on other targets. Does the Dark Matter also get sucked into the black hole? If so, the amount of Dark Matter in our Universe should be decreasing. Because our Universe is expanding, should the Dark Matter be the only exception? I envision a cooperative multi-national effort. First , shuttle pieces and parts to near the ISS where they can be assembled and tested. Then shuttle fuel , food ,water , all other necessities for the journey. Build a Mars based ISS with refueling capabilities for return trips. Many of these things are already engineered , they just need funding and active participation. If we really wanted to , we could do this within a ten year span. You hit the nail on the head about everything. The single word that stops this vision is FUNDING. Which is honestly a stupid concept that we seem to be stuck with at first. Money is just an artificial construct of the race. Money is meaningless. It's just a carrot to get other humans to do something for you. What i Cant understand is the distances involved. Things we are observing today happened long ago because of the time it takes to reach earth. In a sense our view of the universe far away is of what it once was. My question is what are those far away object doing right now? Do they exist? This is amazing news to read, just think how far we have come as a cilvilazation in a matter of a few decades and how much further we would be if Science and not war/religion was a priority in this world. I kept thinking while reading this article how different Science must be for teaching our younger generations and how out dated our older geneerations are without continualy being re-educated. THank u for sharing this article, I lookk forward to the Nu-Stars further developments and discoveries. In all seriousness, in Romney's Mormon world it is due to the restoration of the priesthood, through Joseph Smith that triggered the rapid technological advancements we see today. Without the priesthood , mankind would still be in the dark ages, as it was just after the priesthood was taken from the earth during the Great Apostasy. If it wasn't for the dark ages of man's history, we would have been colonizing space 500 years ago. It's called evolution. You don't go from discovering that rubbing stick together makes fire to building an interplanetary travel system. You have to go down a very long path. I'm just nit-picking, but her post is valid. It seems to me that the trips of historical Earth Journeys took months and months, about what is would take to get to Mars. Think of Columbus, or Magellan, or the wagon trains to the USA west coast om the 1800's. But they did not have to carry all their air and water. John carter can get there faster! WE SHOULD ALREADY HAVE PLANTED LIFE IN MARS BY NOW. ummm... yeah... good luck getting there!!!! The logistics alone would be a nightmare, let alone the actual journey.